Just as striking as Zurbarán's color scheme are his rich, descriptive treatment of the drapery, and the solid masses of his figures. He has arranged the composition in an airy, oval sweep to reveal the subtle play of light and shade. The woman standing at the right in contemporary costume is believed to be a portrait of the donor because she gazes directly toward the spectator. The eggs in her basket allude to the purity of the Virgin and to the Resurrection. Church of the Shod Trinitarians, Seville (one of eight scenes from the Life of the Virgin, once forming a side altar at the epistle side). Marquis of Salamanca;; in Paris c.1880). Count Theodore van Berckheim, Paris, by 1925. Count Alessandro Contini-Bonacossi, Florence; by 1930. Heirs of the Contini-Bonacossi Estate. [E.V. Thaw and Co., Inc., New York]. 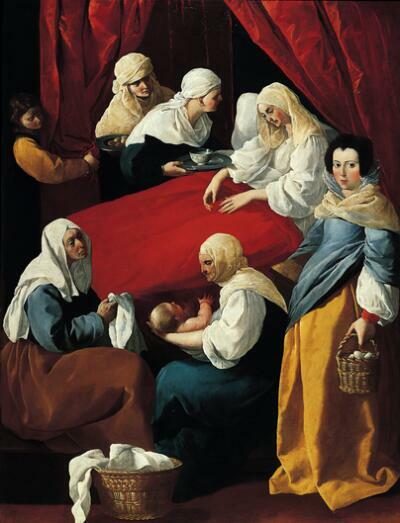 The Spanish painter Francisco de Zurbarán created The Birth of the Virgin in 1627, as part of a cycle of eight paintings dedicated to the life of St. Joseph, Mary’s future husband, and the Virgin. The painting’s bright, luminous colors make a powerful impression. The white of St. Anne’s nightgown and the pale yellow of her headdress, echoed in the shawls and garments of her attendants, are subtle highlights in a sea of stronger colors—scarlet red, smoky blue, yellow, green, ochre, and grey. The steep perspective and sweeping, circular composition are equally remarkable. Zurbarán probably adapted them from a woodcut by the northern master, Albrecht Dürer. On the right stands the woman who commissioned the canvas for a monastery near Seville. She holds a basket of eggs, symbolizing hope and resurrection. The eggs may also allude to a more personal prayer—her desire to bear children of her own. She looks directly out at us, eliciting our spiritual support. The crisp folds of her voluminous dress are characteristic of Zurbarán’s style. An X-ray of the canvas has shown that the donor originally appeared between the two nursemaids in the foreground, where the small basket now stands. Zurbarán later changed his mind and presented her on the right, integrating her more successfully into the sweep of the composition.